Clarion's MAX9700DT GPS in-car GPS system doubles as a mighty entertainment deck. Clarion Japan 's newest in-car satellite navigation system may just be the most advanced driver aid seen since the last episode of 24 and its host of improbable technologies. The MAX9700DT is both a full entertainment system and a GPS unit, but costs more than many second-hand cars. The ¥341,250 (£1,435) 9700 unit will be available in Japan from the end of June as part of a new Clarion line-up that puts the focus on large 7-inch widescreen LCDs and digital television. All models include a 1-seg TV tuner for broadcasts tailored for mobile devices, but the top of the range also includes a standard terrestrial digital tuner for picking up all free-to-air stations. 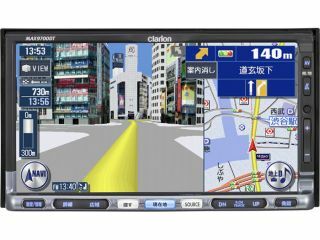 It's easy to ignore the navigation element of a machine like the 9700, but Clarion's usual 3D street display is present and the software can search for and navigate to particular shops or stores based on data broadcast on the digital TV channels. Elsewhere, there's a 40GB hard drive paired with a DVD drive, from which ATRAC, WMA and MP3 files can all be played. The screen is touch-sensitive and can replicate the interface of any iPod (what else?) connected with the appropriate cable. Audio output is of the 5.1 variety, maxing out at four channels of 50W each, while there are SD and Memory Stick slots and even a MiniDisc player. We'd mention the AM/FM radio but it seems somehow insignificant beside that lot.